Our SAP system on AWS has been handling between €15 million and €40 million in transactions every day for six months, and we’ve had no disruption at all. The Netherlands is famous as a world center for flower growing and is home to the planet’s biggest flower auction in Aalsmeer, run by Royal FloraHolland (RFH). In 2016, the auction handled the sale of 12.5 billion plants and flowers, resulting in revenue of €4.6 billion (US$5.33 billion). RFH is also a cooperative for flower growers, bringing the industry together for the mutual benefit of its members and customers. Dubbed “Wall Street for flowers,” the enormous operation requires the support of thousands of staff and sophisticated systems. The finance department alone has 70 people working to process, record, and analyze the millions of transactions that pass through the auction each day. To help support these operations, RFH recently completed a pioneering project to move its SAP financial accounting and reporting system to the Amazon Web Services (AWS) Cloud. When the company’s old financial accounting and reporting system came to the end of its support contract in late 2016, van de Wijnboom and his colleagues decided to move to SAP S/4HANA to bring it in line with their existing SAP Hybris billing system. They approached experts from McCoy & Partners, an SAP consultancy that specializes in implementations in the cloud. With the deadline for moving off the old system fast approaching, McCoy began discussions with the finance team at RFH, as well as the company’s chief digital officer, to determine a hosting environment and architecture. It quickly emerged that AWS would provide the best solution for several reasons. According to Casper Ballemans, solution consultant at McCoy, running SAP on AWS is 40–50 percent cheaper than competing cloud platforms. AWS also provides a wide range of instance types for its Amazon Elastic Compute Cloud (Amazon EC2) service, particularly memory-optimized instance types like R3 and R4, which are ideal for the in-memory compute requirements of SAP S/4HANA. McCoy began work and got a development system online within hours. It is based on Amazon EC2 instances with Amazon Simple Storage Service (Amazon S3) buckets and AWS Lambda to automate simple tasks in AWS through serverless functions. Ballemans says, “We use AWS Lambda for creating backups, starting and stopping instances, and rotating snapshots, for example, with the main benefit being reducing the risk of human error.” The team also monitors the AWS environment with Amazon CloudWatch. McCoy recommended Amazon Virtual Private Cloud (Amazon VPC) to help ensure data is protected. 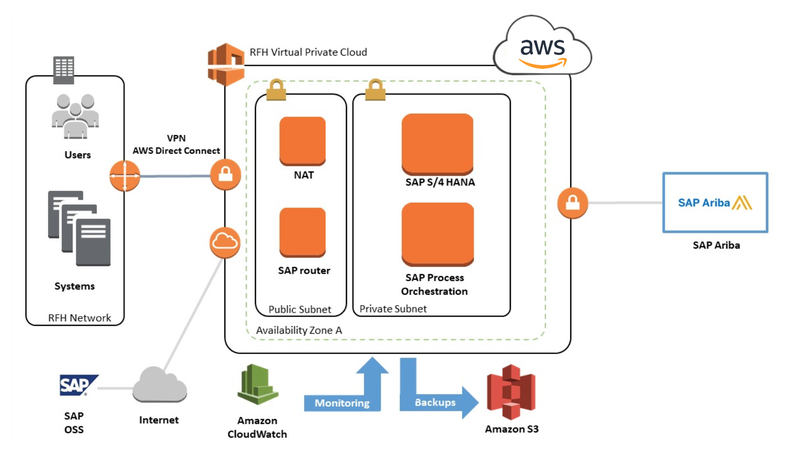 This VPC is connected to RFH’s network using AWS Direct Connect. “We started with a simple security policy, which was ‘deny all,’” says van de Wijnboom. “Then we opened up the ports we needed to open and nothing more. We’ve built security into every layer.” Royal FloraHolland was also able to ensure compliance with internal and national data-protection rules, such as keeping data within the European Union by using the AWS EU (Frankfurt) Region.